If you are the type of person who enjoys beautiful and edible plants, then buying some Nasturtium seeds and planting them may well be an excellent choice. These colorful plants have flowers that glow in jewel bright colors. They make great companion plants for your vegetable garden, as they drive away pests such as squash bugs, attract the lively hummingbirds, and they can be added to dishes you prepare to eat, since the leaves, seeds and flowers of these plants are all edible. Few flowering plants have the versatility of Nasturtiums. Seed Needs is a family owned and operated business that offers over 590 species of flowers, herbs, vegetables and vines to its many customers. This growing business is always adding new seeds to meet the seed needs of its customers, and the 70 Flower Seeds Nasturtium Jewel Mixture is just one of the many high quality packages of seeds offered by this company. Judging by the reviews for these seed packets, the 70 flower Seeds Nasturtium “Jewel Mixture” is an excellent choice, for both the beginner flower gardener, and those with more experience. Customers state that these flower packets have a large germination rate and yield many lovely flowers. When planted in a vegetable garden as a companion plant, customers indicate that these flowers do an excellent job at keeping squash bugs, and even rabbits, away from the garden. Since 1995, Botanical Interests has been supplying home gardeners with high quality seeds that increase the richness and diversity of their yards and gardens. If you are looking for a diverse and colorful way to add interest to your yard or garden, the vine like Tall Single Blend Nasturtium Seeds can do a lot to add something special to your landscape. This Tall Single Blend Nasturtium seed packet will grow climbing Nasturtiums that look great on a fence or spilling over the sides of a planter. Customer reviews across the internet for this seed packet do state that the vine grows quite long, and does need some type of support, but really needs very little tending to grow well. Renee’s Garden run by who else, but Renee, and offers some beautiful and unusual organic heirloom open-pollinated seeds for the home gardener that have been tested for growing in every US climate zone. 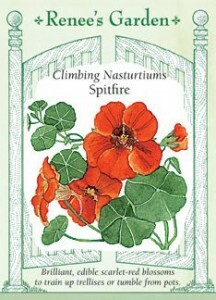 Customer reviews for the Nasturtium Climbing Spitfire Seed Packet state that these flowers germinate and sprout quickly, which results in beautiful color to your garden or yard almost all summer long. This 1 Full Bulk Pound Of Nasturtium Wild Flower Seeds is a great way to grow colorful flowers in various places in your yard. Buying this packet of Nasturtium seeds in bulk is a great way to purchase with other gardening friends and save money doing so. This packet offers plenty of seeds for sharing, and customers state that these seeds have a high yield quality, are easy to grow, and provide bright red, orange, and yellow flowers, as well as some mixed colors. Nasturtium seeds are a great way to add brilliant red, orange, and yellow blossoms to your flower garden, and can also serve as food source, as well as a companion plant in your vegetable garden. Since these plants are extremely easy to grow, they are perfect for the beginning gardener.